Our Easy As ABC baby sweater knit along starts on Tuesday! The supply list is a little long but you will use all of it, I promise. This might be a tiny sweater but we need some important tools to knit it! First you'll need the pattern: Easy As ABC baby sweater. Use code: EASYASABC for 25% off here or on Ravelry.com. Choose your size! The Easy As ABC Baby Sweater knitting pattern comes in three sizes so you'll need to choose the little baby you're going to make it for. These are the sizes available: 6 months (12 months, 18-24 months). The yarn amounts vary for each size so please choose the: Wooly Worsted Washable yarn colors you'd like to use! The sample in the photo is the 6 month size and knit with 2 skeins of Cotton Candy as Color A and 1 skein of Wheat as Color B. Color A: 2(2, 3) skeins of Wooly Worsted. Color B: 1(2, 2) skeins of Wooly Worsted. Second and most exciting is YARN! Ewe Ewe Wooly Worsted yarn is perfect for baby knits because it's washable. That's right, totally washable. 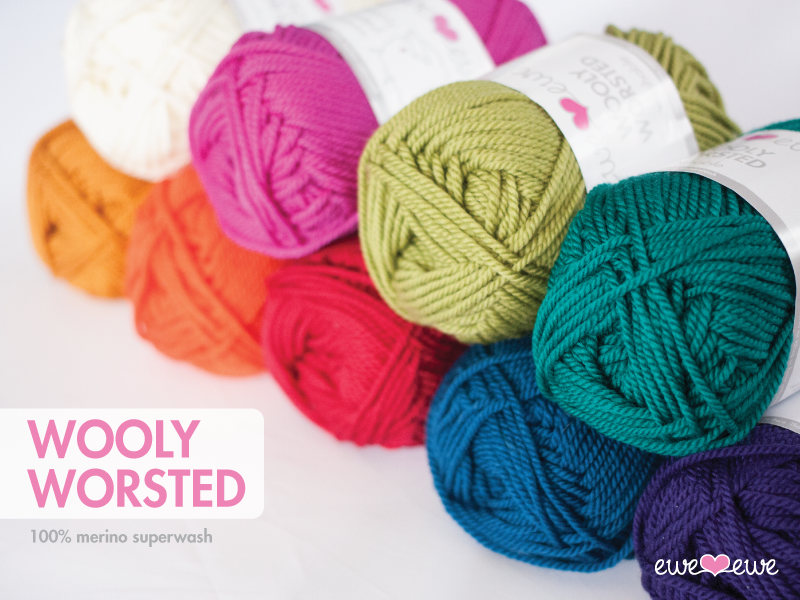 Wooly Worsted is a merino yarn that's been specially coated to not shrink in the wash which means it's soft (awesome for baby) and nearly indestructible (awesome for parents!). 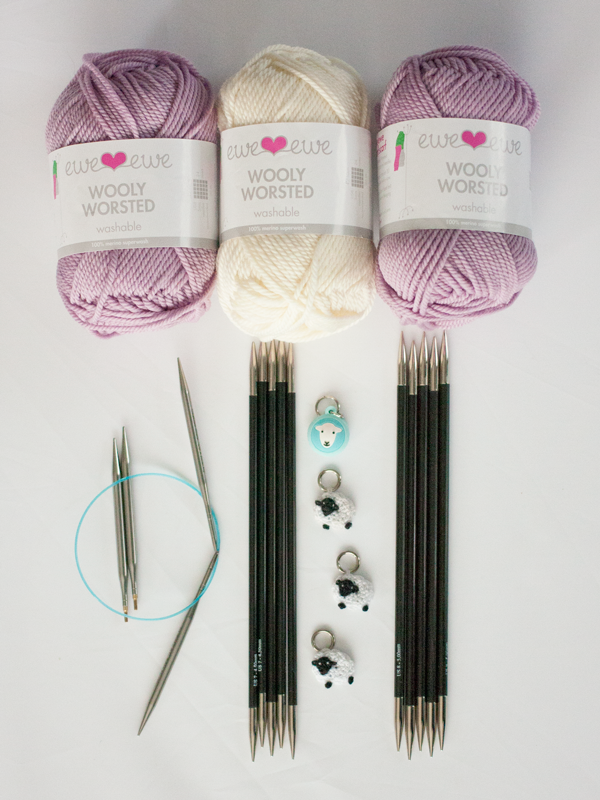 I have an interchangeable knitting needle set which is why I just have the two small needle tips sitting at the left of the photo. If you do a lot of knitting in different weights and sizes, an interchangeable needle set may be just what you need. I am using the HiyaHiya Sharps set seen here. I also really like the Knitters Pride Karbonz needles which is what my double-points are. Lastly is our stitch markers. We will be using ring markers that sit directly on the needles while you knit. You'll need four markers for the pattern and it's a good idea to have three the same and one different because three will be where we increase and the fourth marks the beginning of the round. Find some you love and you'll smile each time you get to it while knitting! Be sure to visit NobleKnits.com or your local Ewe Ewe yarn shop to get your supplies this week! Check out our Where to Buy page to find a yarn shop near you. We start on Tuesday and you can read all the details here. Are you looking forward to the KAL? I hope so! What colors of yarn did you pick?! I'll be making the 6 month size and I'm using Lavender as Color A and Vanilla as Color B.